A magnificent giant soars through the oceans in regal silence. 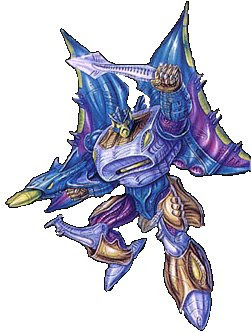 Depth Charge was commissioned by Optimus Primal to act as a first line of defense against Predacon undersea aggressors. Though he would rather study military strategies than execute them, Depth Charge is a dedicated fighter and inspired leader. Nuclear cybershark drone conducts recon missions, doubles as reinforcement in battle, and fires dual proton torpedoes. Intermediate space-cruiser mode can achieve planetary orbit or withstand the deepest oceanic pressures. As a robot, he fires shrapnel grenades from his chest and can maintain a force field for five mega cycles. With unshakable nerves and Energon-cutlass in hand, Depth Charge leads his brave platoon into battle.